Be charmed by the magic of this eternity ring from the Enchanted Disney Fine Jewelry collection. 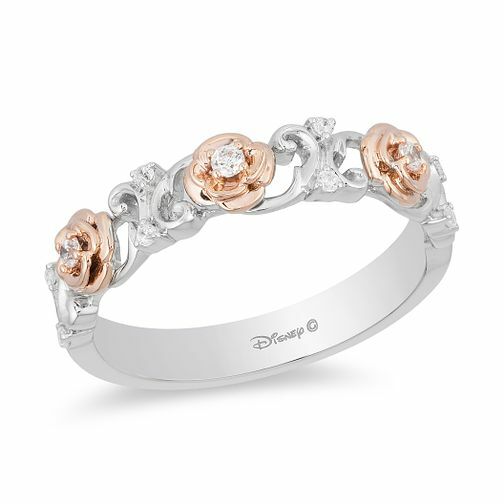 Inspired by Belle, the ring features three enchanted roses in 9ct rose gold with a diamond in the centre. The ring itself is crafted from silver and showcases a labyrinth design adorned with diamonds. The three enchanted roses sit elegantly on top of the smooth band. Enchanted Disney Fine Jewelry Diamond Belle Eternity Ring is rated 5.0 out of 5 by 1. Rated 5 out of 5 by Anonymous from Beautifully crafted ring I purchased this ring as a gift and was very pleased with the quality and price. Staff were really helpful and attentive.